This ideally located 4 bedroom 3 full bath sun filled end unit condo is right at the base of the Snubber lift at Sugarloaf in one of the best locations within the Snowbrook condominium development. 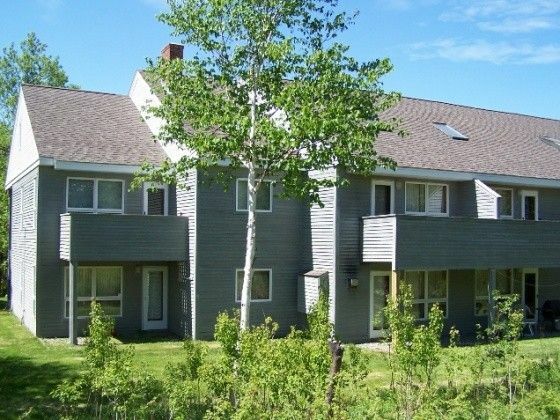 On a dead-end drive adjacent to the ski trail this ski-in ski-out condo offers mountain views, on-site access to x-country ski/hiking/biking trails, pool club (when closed for maintenance the Town pool, or Sugarloaf pool may be used for a small fee), trout pond (ice rink in winter), hiking and biking trails, and tennis courts. During the summer season the main level has air conditioning. Area attractions include skiing, sledding, ice skating, Sugarloaf 's world class Golf Course, extensive outdoor biking and hiking trail network, indoor anti-gravity activity center, Sugarloaf's new zip line, guided activities, shopping and numerous restaurants. Great condo, easy lift access! The condo is roomy with 3 bathrooms and 4 bedrooms. The downstairs had a queen and a king bed, the upstairs had several twin beds in two separate rooms. Kitchen well-equipped. Very easy access to Snubber chair for mountain access. Nice views of Sugarloaf Mountain. Working fireplace with wood available. We had a very nice time and would come again. The owner is accessible by email and quickly responsive to questions. This condo is less than 100 steps to the snubber chairlift. It is extremely convenient and helps with not having to pack the car and find parking in the upper lots which during school vacation weeks can be tough at the loaf. The Condo was big enough for everyone to have their own space and still enjoy each other. Never had to get in touch with the owner because everything was pretty much self explanatory. Would recommend this condo for family with children. We had a great few days at Steven's property. It was the perfect location to access hiking trails and the snubber lift. The condo was fully equipped with everything we needed and had ample space for guests. Steven was responsive and checked in with us just to make sure everything was working properly. I'd love to stay here again and highly recommend it! Awesome place! So convenient for skiing and nice view of the mountain. Owners very helpful! It was a very nice place. We all had fun! The only thing that I would suggest is that more silverware be available. There really wasn't enough to use when it was in the dishwasher. We rented the place for 8 people and only 5 of us were there until midweek until the rest arrived. I'm glad that I brought plastic forks and spoons. Other than that, we really liked our stay! We would definitely recommend the place! Generally nice. The back storm door was removed and in the way in the living room as a result of some exterior renovation. Also, the second floor back door was operational even given the current lack of deck or stairs. Would be a safety hazard for small children until work is completed. The place is a bit dated and a few cobwebs along the ceiling, but generally clean. Nice water pressure and plenty of hot water. Missing dish soap, but we just replaced and left it there. The beds - at least the one in the front downstairs felt about like sleeping on the floor. Overall good stay for the price. Would stay again. X-mas break 12/18 to 12/26 is $350/night.